44,229,198 shares of common stock as of November 5, 2012. Forward-looking statements are made, without limitation, in relation to operating plans, property exploration and development, availability of funds, environmental reclamation, operating costs and permit acquisition. Any statements contained herein that are not statements of historical facts may be deemed to be forward-looking statements. In some cases, you can identify forward-looking statements by terminology such as may, will, should, expect, plan, intend, anticipate, believe, estimate, predict, potential or continue, the negative of such terms or other comparable terminology. Actual events or results may differ materially. In evaluating these statements, you should consider various factors, including the risks outlined in our annual report on Form 10-K for the year ended December 31, 2011, this quarterly report on Form 10-Q, and, from time to time, in other reports that we file with the Securities and Exchange Commission (the SEC). These factors may cause our actual results to differ materially from any forward-looking statement. Given these uncertainties, readers are cautioned not to place undue reliance on such forward-looking statements. These unaudited consolidated financial statements of Crailar Technologies Inc (formerly Naturally Technologies Inc.) (the Company) have been prepared in accordance with generally accepted accounting principles for interim financial reporting and the rules and regulations of the Securities and Exchange Commission. They do not include all information and footnotes required by United States generally accepted accounting principles (U.S. GAAP) for complete financial statements. However, except as disclosed herein, there have been no material changes in the information contained in the audited consolidated financial statements for the year ended December 31, 2011, included in the Companys Form 10-K filed with the U.S. Securities and Exchange Commission. Operating results for the nine months ended September 30, 2012 are not necessarily indicative of the results that may be expected for the year ending December 31, 2012. These interim unaudited consolidated financial statements should be read in conjunction with the information included in the Companys Form 10-K filed on March 22, 2012 with the U.S. Securities and Exchange Commission. In the opinion of management, the accompanying balance sheet and related interim statement of operations and cash flows include all adjustments, consisting only of normal recurring items, necessary for their fair presentation in conformity with U.S. GAAP. Preparing financial statements requires management to make estimates and assumptions that affect the reported amounts of assets, liabilities, revenue, and expenses. Actual results and outcomes may differ from managements estimates and assumptions. Effective on October 31, 2012, the Company changed its name to Crailar Technologies Inc. and the trading symbols were changed to CRLRF on the OTC Bulletin Board and to CL on TSX Venture Exchange. The Company evaluated events occurring between the end of its fiscal quarter, September 30, 2012, and the date financial statements were issued. Recent accounting pronouncements with future effective dates are not expected to have an impact on the Companys financial statements. During the nine month period ended September 30, 2012, $766,012 (2011 - $630,564) was incurred for remuneration to officers and directors of the Company. Of this amount, $766,012 (2011 - $459,564) was recorded as salaries and benefits expense and $nil (2011 - $171,000) was recorded as consulting and contract labour expense. During the nine month period ended September 30, 2012, three directors of the Company advanced a total of $300,000 in loans to the Company. The loans were fully repaid as at September 30, 2012 and the Company paid $5,780 interest. A total of 703,729 shares were issued pursuant to the exercise of employee and consultants options for proceeds of $752,293. Options totalling 458,079, with proceeds of $500,458 were exercised by the directors and officers of the Company. A total of 626,751 shares issued pursuant to the exercise of warrants for proceeds of $831,767. Proceeds of $69,000 were received after September 30, 2012 and included in subscription Receivable as at September 30, 2012. A total of 21,840 shares issued pursuant to the exercise of agents warrants for proceeds of $26,062. A total of 869,187 units were issued at $2.21 per unit for gross proceeds of $1,920,903. Proceeds of $64,050 were received after September 30, 2012 and included in Subscription Receivable as at September 30, 2012. Each unit consists of one common stock and one-half of one stock purchase warrant of the Company. Each whole warrant entitles the holder to purchase one additional common share of the Company at an exercise price of $3.45 per share for a two year period. The estimated far value of the warrants is $273,681 using Black Scholes option pricing mode, an expected volatility of 75% and a risk free interest rate of 0.23%. The fair value of the warrants is included in Additional Paid-in Capital. The Company paid $73,420 for agent commissions and other expenses which have been recorded as share issue costs. As at September 30, 2012, the Company received proceeds of $220,972 for units issued after the period end. The weighted average remaining life is 0.92 years. During the nine month period ended September 30, 2012, 703,729 options were exercised and a total of $439,626 has been reclassified from additional paid-in capital to capital stock. During the nine month period ended September 30, 2012, the Company granted a total of 125,000 options with a term of 5 years to employees, exercisable between $1.91 - $3.05 per share, with a fair value of $210,136. These options were granted under the terms of the Companys 2011 Fixed Share Option Plan. During the nine month period ended September 30, 2012, 1,288,330 (2011: 3,216,490) options vested under the Companys 2011 Fixed Share Option Plan. A total expense of $1,944,411 (2011: $1,632,426) was recorded as stock-based compensation, of this amount $185,147 (2011-$653,672) was included in consulting and contract labour expense and $1,759,264 (2011- $978,754) was included in salaries and benefits expense. As at September 30, 2012, the inventory consists of the cost of flax seed, harvested raw flax fiber feedstock and decorticated fiber. During 2011, the Company signed agreements to purchase equipment for a total price of $9,953,721 (Euro 7,418,140 and $416,960), which is payable in installments and due upon the achievement of certain milestones. Full payment is expected within 2012. The Company paid $6,813,475 (Euro 5,101,511 and $254,972) as deposits. No amortization will be taken until the equipment is in production. On September 20, 2012, the Company completed the offering of $10,231,000 ($10,000,000 CDN) convertible debentures (the Notes). The Notes mature on September 20, 2017. The Notes bear interest at a rate of 10% per year, payable semi-annually on March 31st and September 30th, starting March 31, 2013. As at September 30, 2012, accrued interest of $27,865 was included in accrued liability. Holders of the Notes have the option to convert the Notes at a price of $2.90 per Common Stock at any time prior to the maturity date. The Company may redeem the Notes after September 30, 2015 provided that the market price at the time of the redemption notice is not less than 125% of the conversion price. The Notes are secured by a Guaranty and Security Agreement signed with the Companys wholly-owned subsidiary, Naturally Advanced Technologies US Inc. (NAT-US), a Nevada incorporated company. NAT-US provides a security interest over its assets, having an aggregate acquisition cost of no less than US$5,500,000, as security for its guarantee obligation which shall rank in priority to all other indebtedness of NAT-US. In accordance with Accounting Standards Codification 470-20, the Notes do not contain a beneficial conversion feature, as the fair value of the Companys common stock on the date of issuance was less than the conversion price. All proceeds from the Notes were recorded as a debt instrument. The Company paid a total of $1,059,990 ($1,036,057 CDN) for agent commission and other expenses which have been recorded as deferred issuance costs for long term debt. During the nine month period ended September 30, 2012, the Company recorded $5,806 ($5,675 CDN) as interest expenses for the amortization of the deferred issuance costs. The Company granted an Over-Allotment Option (the Over-Allotment Option) to the underwriter for purchasing up to 15% of the principal amount of the Notes on the same terms and conditions. The Over- Allotment Option expired without being exercised. Derivative liability consists of warrants that were issued in private placements which have exercise prices denominated in US dollars (a currency other than the Companys functional currency). The fair value of these warrants was determined using the Black-Scholes option pricing model. The fair value adjustment on derivative liability has no effect on the Companys cash flows. During the nine month period ended September 30, 2012, the Company signed a lease for an industrial and office building. The initial term of the lease is for ten years with two additional five-year extension terms. Commencing January 1, 2014, the annual basic rent will be $146,930 and increasing to $220,395 from June 1, 2018 to May 31, 2022. Subsequent to September 30, 2012, 107,500 options were exercised for proceeds of $104,775. Subsequent to September 30, 2012, 198,587 units were issued at $2.21 per unit for proceeds of $438,877, of which $220,972 received before September 30, 2012. Each unit consists of one common share and one half non-transferable stock purchase warrant. Each whole stock purchase warrant is exercisable at $3.45, expiring October 10, 2014. Subsequent to September 30, 2012, the Company granted 1,809,500 options, with a 5 year term, and an exercise price of $2.23. The options vest over a 12 month period commencing on November 30, 2012. Subsequent to September 30, 2012, the Company has been received a grant in the amount of $263,500 from the South Carolina Coordinating Council for Economic Development and Florence County to be used for the Companys manufacturing and production in the region. The matters discussed in these sections that are not historical or current facts deal with potential future circumstances and developments. Such forward-looking statements include, but are not limited to, the development plans for the Companys growth, trends in the results of the Companys development, anticipated development plans, operating expenses and the Companys anticipated capital requirements and capital resources. As such, these forward-looking statements may include words such as plans, intends, anticipates, should, estimates, expects, believes, indicates, targeting, suggests and similar expressions. The actual results are expected to differ from these forward-looking statements and these differences may be material. Our net operational loss from continuing operations during the three-month period ended September 30, 2012, was ($2,031,503) compared to ($465,099) during the three-month period ended September 30, 2011 (an increase in loss of $1,566,404). The increase in loss was due to a lesser gain in the fair value adjustment of a derivative liability, a decrease in gain in foreign exchange, and a decrease in stock based compensation while there was an increase in salaries and benefits expense, an increase in general and administrative expense, research and development costs amortization and depreciation costs and a decrease in consulting and contract labour costs. $935,827 (2011: $925,323) in salaries and benefits, an increase of 1%. Advertising and promotion expenses increased to $225,074 for the three-month period ended September 30, 2012, from $68,882 for the same period in 2011. The increase in advertising and promotion was primarily due to payments made to growers as incentives. Amortization and depreciation expenses increased to $60,080 for the three-month period ended September 30, 2012, from $16,767 for the same period in 2011. The increase in plant equipment depreciation was the cause for the increase in expense. Consulting and contract labor expenses decreased to $201,137 for the three-month period ended September 30, 2012, from $275,943, compared to the same period in 2011, primarily due to decrease in stock-based compensation and some management costs now being expensed to salaries and benefits expense. General and administrative expenses increased to $270,155 for the three-month period ended September 30, 2012, compared to $156,566 for the same period in 2011. The increase in general and administrative expenses was primarily due to travel and office costs. Interest expenses increased to $41,421 for the three-month period ended September 30, 2012, compared to $8,437 for the same period in 2011. The increase is attributable to loans several directors made to the Company during the quarter and interest charged on the convertible debenture debt. Professional fees were $96,636 for the three-month period ended September 30, 2012, compared to $98,592 for the same three-month period in 2011. Research and development costs were $292,033 for the three-month period ended September 30, 2012, compared to $179,434 for the same three-month period in 2011. During the period equipment modification, the processing of CRAiLAR® fiber for our development partners and the testing at our third party manufacturing partners have been our principle research and development costs. Our development partners purchased approximately $112,221 of Crailar fiber, which has been subtracted from those costs. Salaries and benefits expenses increased to $935,827 for the three-month period ended September 30, 2012, compared with $925,323 for the same period in 2011. This increase was caused by additional hires. Our net loss during the three-month period ended September 30, 2012, was ($2,031,503) or ($0.05 per share), compared to ($465,099) or ($0.01 per share) during the three-month period ended September 30, 2011, which represents an increase in net loss of 337%. The increase in loss was due primarily to a smaller gain in the fair value adjustment of derivative liability, an increase in advertising and promotion expense, an increase in general and administrative expense and an increase in research and development expense. For the three-month period ended September 30, 2012, the weighted average number of shares outstanding was 42,865,834 compared to 40,741,147 at September 30, 2011. Our net operational loss from continuing operations during the nine-month period ended September 30, 2012, was ($6,264,449) compared to ($4,384,770) during the nine-month period ended September 30, 2011 (an increase in loss of $1,879,679). The increase in loss was due to an increase in advertising and promotion expense, an increase in amortization and depreciation expense, salaries and benefits expense, stock based compensation and an increase in general and administrative expense and professional fees. $3,123,469 (2011: $1,620,098) in salaries and benefits, an increase of 93%. Advertising and promotion expenses increased to $342,850 for the nine-month period ended September 30, 2012, from $178,485 for the same period in 2011. The increase in advertising and promotion was primarily due to payments made to growers as incentives. Amortization and depreciation expenses increased to $164,678 for the nine-month period ended September 30, 2012, from $38,065 for the same period in 2011. The increase in plant equipment depreciation was the cause for the increase in expense. Consulting and contract labor expenses decreased to $590,706 for the nine-month period ended September 30, 2012, from $899,350 compared to the same period in 2011, primarily due to a decrease in stock-based compensation and some management costs now being expensed to salaries and benefits expense. General and administrative expenses increased to $712,633 for the nine-month period ended September 30, 2012, compared to $393,799 for the same period in 2011. The increase in general and administrative expenses was primarily due to travel and office costs. Interest expenses decreased to $41,425 for the nine-month period ended September 30, 2012, compared to $87,297 for the same period in 2011. The decrease is attributable to the repayment of loans that were outstanding in the same period in 2011. Professional fees were $495,217 for the nine-month period ended September 30, 2012, compared to $297,107 for the same nine-month period in 2011. The primary cause for the increase was associated with the new facility in South Carolina, costs associated with being Sarbanes Oxley Act compliant and to timing issues of year end costs and an increase in some legal costs. Research and development costs were $645,138 for the nine-month period ended September 30, 2012, compared to $627,503 for the same nine-month period in 2011. During the period equipment modification, the processing of CRAiLAR® fiber for our development partners and testing at our third party manufacturing partners along with the quarterly payment to the NRC have been our principle research and development costs. Our development partners purchased approximately $139,582 of Crailar fiber, which has been subtracted from those costs. Salaries and benefits expenses increased to $3,123,469 for the nine-month period ended September 30, 2012, compared with $1,620,098 for the same period in 2011. This increase was caused by additional hires, management costs that were previously recorded under consulting and contract labour now recorded as salaries and benefits and an increase in stock based compensation. Our net loss during the nine-month period ended September 30, 2012, was ($6,264,449), or ($0.15 per share) compared to ($4,384,770) or ($0.12 per share) during the nine-month period ended September 30, 2011, which represents an increase in net loss of 43%. The increase in loss was due primarily to an increase in advertising and promotion expense, general and administrative expense, amortization and depreciation expense, research and development expense, and salaries and benefits expense as well as a loss from the fair value adjustment of a derivative liability. For the nine-month period ended September 30, 2012, the weighted average number of shares outstanding was 42,617,860 compared to 37,362,272 at September 30, 2011. $10,231,000 in convertible debenture debt. With the issuance of the convertible debenture debt and unit offering in the third quarter of 2012, the Company has enough liquidity to complete the facility build out in Pamplico, South Carolina and to start commercial production. The Company anticipates the commissioning of the facility in December 2012. Stockholders Equity increased by $9,720 from $9,242,773, at December 31, 2011, to $9,252,493 at September 30, 2012. The cash flows used in operations of continuing operations for the nine-month period ended September 30, 2012, were ($5,232,961) compared with ($3,071,092) for the same period in 2011. Cash flows used in operations for the nine-month period ended September 30, 2012, consisted primarily of a net loss of ($6,264,449) (2011  ($4,384,770)) from continuing operations, offset by certain items, amortization and depreciation $164,678 (2011- 38,065); stock based compensation of $1,944,411 (2011 - $1,632,426), fair value adjustment of derivative liability $188,972 (2011  $375,153); deferred financing costs of $5,806 (2011 - $Nil); a decrease in accounts receivable $17,434, (2011  ($61,911)); and increase in inventory ($1,821,585), (2011  ($566,852)); a decrease in prepaid expenses of $10,974, (2011  ($9,568)); increase in accounts payable of $440,083 (2011  ($219,152)), and an increase in accrued liabilities of $115,583, (2011  ($124,483)). The cash flows used in investing activities for the nine-month period ended September 30, 2012, were ($6,080,218) compared to ($358,677) for the same period in 2011. Cash flows used in investing activities consisted of a purchase of property and equipment totaling ($6,048,478) in (2011  ($308,819)) and the acquisition of trademarks and licenses totaling ($31,740) in (2011  ($49,858)). Cash flows provided by financing activities for the nine-month period ended September 30, 2012, totaled $12,716,536 versus $14,584,069 during the same period in 2011. The Company issued capital stock for proceeds of $3,545,538 (2011 - $15,541,014) and convertible debentures for net proceeds of $9,171,010 (2011 - $nil). The effect of exchange rates on cash resulted in an unrealized gain of $113,669 for the nine-month period ended September 30, 2012, as compared with an unrealized loss of ($561,616) in the same period of 2011. Because CRAiLAR® Fibers can be an ingredient in countless products, management believes that partnering with the largest, most successful brands, all of which are top of mind to the North American consumer, is the path to successful commercialization. The Company has signed development and supply agreements with some of the worlds largest fiber consuming companies such as Hanesbrands Inc, Levis Strauss & Co., Georgia-Pacific, and Target. Sustainability, risk mitigation, consumer satisfaction and product enhancement are all offered within the CRAiLAR® experience. 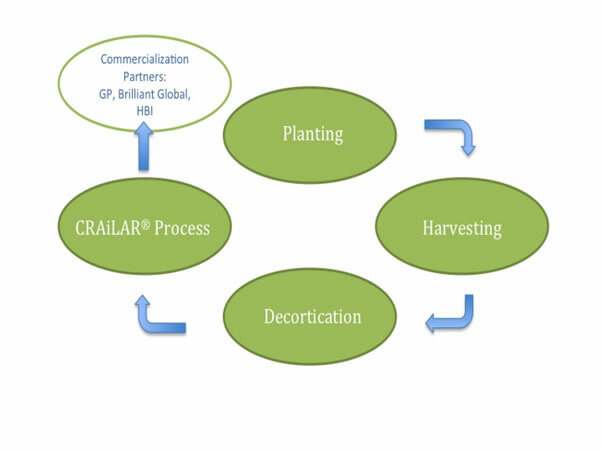 As we move forward to commercialization, our partners are not only successfully integrating our CRAiLAR® flax fiber within their biggest product categories, but as well, discovering benefits and enhancements which are exclusive to their developments, allowing the CRAiLAR® brand to evolve and grow, while servicing both the consumer and business needs. In the near future, we will be working in tandem with our partners to extol the virtues of CRAiLAR® through co-branding, ingredient call-outs, co-op marketing efforts, in-store signage, point of purchase and links to the relevant social media networks and websites. Our own presence and prosperity will grow in concert with the growth of our growers and business partners, allowing CRAiLAR® to be top of mind, similar to great ingredient brand successes such as Gore-Tex® and Intel®. The Company has identified the Williamsburg County/Florence County regions of South Carolina as ideal region for growing winter flax crops. As a result of identifying this geographical area as an ideal growing region, we incorporated a wholly owned subsidiary, Naturally Advanced Technologies, US Inc. (which is being renamed Crailar Inc.). The purpose of this subsidiary is to develop a US based flax fiber industry based around our CRAiLAR® fiber technology; from the contracting of crops through to the processing of the fiber. Our first commercialization partner, Hanesbrands, is headquartered in North Carolina. Hanesbrands uses contract spinners located throughout the states of North and South Carolina. Therefore, being able to procure textile grade fiber in this region allows the Company to take advantage of strategic logistical opportunities. We entered into a sub lease of a mid volume decortication facility located in Kingstree, South Carolina, in early August of 2010. The facility was originally established under a USDA flax initiative that failed to reach commercial viability. The equipment in this facility is designed to mechanically separate the flax fiber from the rest of the plant. This stage is called decortication. This is the first step of our process before it goes through our patented CRAiLAR® wet process. We have used this facility to prove out the viability of flax farming in this region, perfect our decortication process and to commence early volumes of CRAiLAR® fiber to our commercial partners. In August 2011, we took over the lease for a term of one year, and during July 2012 we extended the lease until the end of 2012. In March 2012, we signed a lease for an approximately 147,000 square foot building on 52 acres outside of Pamplico, South Carolina. The building is currently undergoing the renovations necessary to process CRAiLAR® fiber. In the first stage, the decortication process will begin in Q4 of 2012 with wet processing planned to begin in Q3 2013. In addition to signing our joint development agreements with Hanesbrands and Georgia Pacific, we licensed a third party processor of natural fibers, Littlewoods Inc. of Philadelphia, to run interim scale quantities of up to 40,000 pounds per week of CRAiLAR® Fiber, to feed our commercialization scale up and additional market development plans, in denim, work wear, knit garments, domestic textiles and home furnishings. In late January of 2012, we announced that we had signed our second yarn development partner, Tuscarora Yarns of Greensboro NC. Tuscarora are a highly innovative yarn spinner, capable of blending CRAiLAR® with fibers other than cotton, to broaden our market capabilities in performance sportswear, higher end fashion and outerwear. This is a strategic initiative that will add to the CRAiLAR® list of performance attributes, while strengthening our brand capabilities at the consumer interface. In March 2012 we entered into an agreement with Tintoria Piana to execute the CRAiLAR® enzymatic process, augmenting the Companys plans for manufacturing capacity. The agreement calls for Tintoria to commence production in Q3 2012. Tintorias history in textiles dates to 1582 in Biella, Italy. The privately held, family-owned business has dyed fiber for the traditional apparel business for more than 60 years, and operates principally out of Cartersville, Georgia in North America. In March 2012 we announced that we had partnered with Barnhardt Manufacturing Company to further expand its manufacturing capacity. The agreement calls for Barnhardt to execute the CRAiLAR® enzymatic process exclusively for our Company, and expands upon the Companys manufacturing plans. demand from existing and future partners. Barnhardt will commence production for our Company in Q3 2012. In July 2011, we entered into an agreement with Carolina Eastern to provide agronomic consultation. Carolina Eastern will assist in the recruitment of growers and contractors and advise on all cultivation plans regarding flax. The Company has planted enough acres to produce roughly 5,000,000 lbs of CRAiLAR®. To assist on the recruitment of growers Carolina Eastern and the Company has hosted a number of farm days in Williamsburg and Florence Counties, South Carolina, which have been well attended by growers interested in growing flax. In March 2012, the Company appointed Mr. Steve Sandroni as Vice President of Agriculture. Mr. Sandroni brings more than 34 years of experience working in various aspects of agribusiness to the Company. Mr. Sandroni oversees the Companys global agricultural efforts. He liaises with farmers and will hire regional support staff in the Companys primary growing regions. By July of 2012 harvesting of the contracted flax acreage in South Carolina was completed. We worked with representatives of Carolina Eastern to complete the harvest. All fibre from the harvest is now on our property in Pamplico SC and ready for processing upon commissioning of the decortication line. Planting for the 2013 spring harvest is taking place in October and November and the Company expects to contract with growers for between 6,000 and 10,000 acres of flax fiber. Our Company is expanding its agronomic focus to include multiple North American and international growing regions. Expansion of the growing region will mitigate climate risk and large expenditures associated with harvest. Throughout the summer 2012 our Company contracted 771 acres of flax to be grown in Canada for the purpose of seed multiplication. The seed generated will be used for subsequent planting in South Carolina including the planting currently under way. With the proceeds of our financing in July 2011, we began to install our first fully integrated CRAiLAR® Fiber processing facility in the Florence region of South Carolina. Our Company has signed a lease of an existing building in the region, for the housing of its first fully integrated decortication and enzyme treatment processing facility. The installation of our full scale decortication facility is currently underway and purchase orders plus deposits for the equipment needed to enzymatically process CRAiLAR® Fiber have been issued. The installation of that equipment in the new facility commenced in the second quarter of 2012. With the completion of the September 2012 financing the Company will complete the build out of the facility along with the necessary equipment purchases for the decortication process. The Company expects the decortication phase of the new facility to become operational in the 4th quarter of 2012, and to ramp up production through 2013. At full capacity, the new facility will be capable of producing 600,000 pounds per week of decorticated bast fiber ready for the CRAiLAR® wet process. Feedstock in 2013 will come from the American Southeast and Europe. In March 2012, we announced an improvement of our CRAiLAR® wet process time by 40%, therefore significantly increasing anticipated volume capabilities at planned facilities. The evaluation and resulting improvements were conducted internally in conjunction with research partners. The resulting changes encompass processes, as well as the utilization of industry standard equipment, including that which was purchased by the Company for its first production facility. These reductions in overall cycle time increase throughput and production capacity in each planned facility. These efficiencies also allowed the Company to evaluate third-party manufacturers to increase overall production volume of CRAiLAR® Flax through a quicker expansion model. As a result of this optimized process, we entered into the agreements with Tintoria Piana and Barnhardt Manufacturing to execute the CRAiLAR® enzymatic process, augmenting the Companys plans for manufacturing capacity. During Q3 and Q4 2012, the Company will process fiber through its third party manufacturing partners using decorticated fiber from its smaller scale facility in Kingstree, S.C. and European sources. The Company believes that outsourced manufacturing allows for faster expansion of our technology proposition while significantly reducing the capital requirements to scale up to meet demand. In summary, the Companys decortication facility will come on line in Q4 2012, with production quantities starting in Q1 2013. The Company will use third party manufacturers for the CRAiLAR® wet process in Q1 & Q2, 2013, and volume is expected to grow to 450,000 lbs per week. In Q3 2013, the Company plans to have its own wet processing facility come online , bringing an additional 600,000 lbs per week of potential CRAiLAR® capacity to the 450,000 lbs from third party manufacturers. Decorticated fiber for the additional capacity will come from the Companys Pamplico decortication facility and European decorticated fiber. Finally, the testing and evaluation of our CRAiLEXTM Advanced Materials pulping technology continues with a joint development agreement with Hercules Incorporated, a subsidiary of Ashland Inc.
CRAiLEXTM is the brand name for the purified pulp created from a patented process that is exclusively held by the Company. In recent tests, CRAiLEXTM has proven to exhibit higher-grade value pulps than other hard or soft-wood pulps. This is due to the unique cellular structure of bast fibers, namely hemp, and the less damaging CRAiLEXTM pulping process, which preserves the fiber integrity. The pulps are used by Ashland to create its line of cellulosic products including ethers and additives for multiple industries. We would create market opportunities in the higher end cellulosic yarns market, which we plan to market to our growing roster of global apparel brands. We expect the completion of the final round of evaluation and testing of our dissolving pulp qualities to be confirmed by Ashland in Q4 of 2012, whereafter the structure of commercialization of the technology will become a key priority. CRAiLAR®and CRAiLEXTM production models integrate seamlessly at the agricultural and decortication level. The separation into the two distinctive patented manufacturing process thereafter creates the two unique opportunities in the natural fiber and dissolving pulp markets, with go to market strategies overlapping in the natural fiber and cellulosic yarn markets, along with composites and non-woven manufacturing. The additives and ethers market dominated by Ashland Inc. would potentially be controlled by Ashland in an integrated business venture with Ashland. With the necessary strategic partnerships and management team in place the Company believes it is well positioned to execute its commercial roll out plan in 2012 and 2013. While the Company expects that profitable operations will be achieved in the future, there can be no assurance that revenue, margins, and profitability will increase, or be sufficient to support operations over the long term. Management expects that the Company will need to raise additional capital to meet short and long-term operating requirements. Management believes that private placements of equity capital and debt financing may be adequate to fund the Companys long-term operating requirements. Management may also encounter business endeavors that require significant cash commitments or unanticipated problems or expenses that could result in a requirement for additional cash. If the Company raises additional funds through the issuance of equity or convertible debt securities other than to current shareholders, the percentage ownership of current shareholders would be reduced, and such securities might have rights, preferences or privileges senior to the Companys common stock. Additional financing may not be available upon acceptable terms, or at all. If adequate funds are not available or are not available on acceptable terms, the Company may not be able to take advantage of prospective business endeavors or opportunities, which could significantly and materially restrict business operations. Management is continuing to pursue external financing alternatives to improve the Companys working capital position and to grow the business to the greatest possible extent. At September 30, 2012, the Company signed agreements to purchase equipment for a total price of $9,953,721 (Euro 7,418,140 and $416,960), which is payable in installments and due upon the achievement of certain milestones. Full payment is expected within 2012. The Company paid $6,813,475 (Euro 5,101,511 and $254,972) as deposits. No amortization will be taken until the equipment is in production. In October 2007, the Company entered into a joint collaboration agreement with the NRC to continue to develop a patentable enzyme technology for the processing of hemp fibres. The agreement was for three years and was set to expire on May 9, 2010. On February 19, 2010, the Company signed an amendment to the agreement which expired on May 9, 2012. The Company is currently negotiating a new joint collaboration agreement with the NRC. The Company will continue its joint collaboration of enzyme technology with the NRC, however the research will refocus on cellulose technology for the production of lignocellulosic ethanol. The NRC is to be paid as it conducts work on the joint collaboration. There are no further costs or other off-balance sheet liabilities associated with the NRC agreement. Over the term of the amended agreement, the Company paid the NRC all amounts due for a total of $280,536. On November 1, 2006, the Company entered into a technology license agreement with the NRC. The license agreement provides the Company a worldwide license to use and sublicense the NRC technology called CRAiLAR®. The Company paid an initial $25,000 (CDN $25,000) fee and will pay an ongoing royalty of 3% on the first $50,000,000 of sales, with the royalty dropping to 1.5% of sales over $50,000,000 of products derived from the CRAiLAR® process to the NRC with a minimum annual payment set at $15,000 (CDN$15,000) per year. In June 2007, the Companys subsidiary, Crailar Fiber Technologies Inc. (CFT), entered into a Master Agreement for Technology Development with the Alberta Research Council (ARC) now know as Alberta Innovates-Technology Futures (AITF) (the Technology Agreement) to further develop and commercialize bast fiber technology. The Technology Agreement is intended to act as an umbrella agreement for further bast fiber development planned to be performed by the AITF under separate Project Agreements. During 2011 the Company paid the ARC for specific tasks to further the development of AITFs Technology, the amount paid was $135,890. During Q2 2012, AITF ran a small project for the Company worth $2,000; no other monies were paid or owed for 2012. Under the terms of the Project Agreements signed with AITF the Company will be entitled to an exclusive, worldwide, royalty-bearing license to use any new intellectual property developed pursuant to the Project Agreements. The royalty based on this option will be 3% of gross sales for the first $50,000,000 and 1.5% of gross sales on excess of $50,000,000. The Technology Agreement is in effect as long as there is an active Project Agreement. On August 9, 2011, the Company renewed the agreement for a firm to perform investor relations activities. The agreement term is one year with ninety days notice of termination by either party. The monthly fee is $10,000 with 70,000 stock options exercisable at $2.77 expiring August 19, 2016.The options were granted under the 2010 Option Stock Plan and were valued at $148,862 using the Black-Scholes option pricing model. Starting in December 2010, a co-operative research project designed to cultivate and evaluate the viability of various flax strains for use in CRAiLAR® technology was signed with the United States Department of Agriculture, HanesBrands and the Company. The project has an initial term of one year with a renewal option for two additional years. We will contribute annually $51,000 of in-kind expenses towards the project. During the nine month period ended September 30, 2012, the Company committed a minimum to $235,252 ($231,300 CDN) in flax seed purchases from growers in Alberta. The seed will be used for future North American harvests. Effective October 31, 2012, the Company effected a name change from Naturally Advanced Technologies Inc. to Crailar Technologies Inc. This name change was effective under the Business Corporations Act (British Columbia) as of October 31, 2012, pursuant to a Notice of Alteration that was filed with the British Columbia Registrar of Companies on October 22, 2012. The name change became effective with the TSX Venture Exchange on October 31, 2012 under the stock symbol CL and with the OTC Bulletin Board at the opening for trading on November 1, 2012 under the stock symbol CRLRF. The Companys new CUSIP number is 224248104. Concurrent with the change of name, the Company adopted new articles in the form approved by the Companys shareholders at the Companys annual general and special meeting which was held on August 8, 2012 (the New Articles). Among other things, the New Articles facilitate the use of uncertificated shares and electronic record keeping systems currently in use worldwide. In addition, under the New Articles the Company increased the quorum requirement for meetings of shareholders from two shareholders (or one shareholder if there was only one shareholder entitled to vote at a meeting of shareholders) to 1/3 of the outstanding shares of the Company. Although the Company conducts its business principally in Canada, the majority of its purchases are made in U.S. currency. Additionally, the majority of the Companys debt is denominated in U.S. currency. The Company does not currently hedge its foreign currency exposure and accordingly is at risk for foreign currency exchange fluctuations. Credit risk is managed by dealing with customers whose credit standing meets internally approved policies, and by ongoing monitoring of credit risk. The risk in cash accounts is managed through the use of a major financial institution which has high credit quality as determined by the rating agencies. As at September 30, 2012, the Company does not have significant concentrations of credit exposure. All term debt has fixed interest rates and the Company has no significant exposure to interest rate fluctuation risk other than at renewal. Kenneth Barker, our Chief Executive Officer, and Guy Prevost, our Chief Financial Officer, have evaluated the effectiveness of our disclosure controls and procedures (as defined in Rule 13a-15(e) of the Exchange Act) as of the end of the period covered by this Quarterly Report. Based on that evaluation, they concluded that our disclosure controls and procedures were effective as of September 30, 2012. There were no changes in our internal control over financial reporting that occurred during our fiscal quarter ended September 30, 2012 that have materially affected, or are reasonably likely to materially affect, our internal control over financial reporting. Management is not aware of any legal proceedings contemplated by any governmental authority or any other party involving us or our properties. As of the date of this Report, no director, officer or affiliate is a party adverse to us in any legal proceeding, or has an adverse interest to us in any legal proceedings. Management is not aware of any other legal proceedings pending or that have been threatened against us or our properties. We have a history of operating losses, expect to continue to incur losses, may never be profitable, and must be considered to be in the development stage. Further, we have been dependent on sales of our equity securities and debt financing to meet our cash requirements. We have incurred losses totaling approximately $6,264,449, $6,998,922 and $3,293,439, respectively, for the nine month period ended September 30, 2012, and the fiscal years ended December 31, 2011 and 2010. As of September 30, 2012, we had accumulated deficits of $17,716,752. As at September 30, 2012 we had cash and cash equivalents of $7,857,531 and working capital of $9,477,668. Further, we do not expect positive cash flow from operations until Q2 2013. There is no assurance that actual cash requirements will not exceed our estimates. Based upon our historical losses from operations, we may require additional funding in the future. If we cannot obtain capital through financings or otherwise, our ability to execute our development plans and achieve profitable operational levels will be greatly limited. Historically, we have funded our operations through the issuance of equity and short-term debt financing arrangements. We may not be able to obtain additional financing on favorable terms, if at all. Our future cash flows and the availability of financing will be subject to a number of variables, including demand for CRAiLAR® and CRAiLEXTM technologies. Further, debt financing could lead to a diversion of cash flow to satisfy debt-servicing obligations and create restrictions on business operations. If we are unable to raise additional funds, it would have a material adverse effect upon our operations. Our Success is Dependent Upon the Acceptance of CRAiLAR®and CRAiLEXTMTechnologies. Our success depends upon our achieving significant market acceptance of our CRAiLAR®and CRAiLEXTM Technology and demand for alternative bio-based products. Acceptance of our CRAiLAR®and CRAiLEXTM Technology will depend on the success of our and our partners promotional and marketing efforts and ability to attract customers. To date, we have not spent significant funds on marketing and promotional efforts, although in order to increase awareness of our products we expect our partners to spend a significant amount on promotion, marketing and advertising in the future. If these expenses fail to develop an awareness of our CRAiLAR®and CRAiLEXTM Technologies and products, these expenses may never be recovered and we may never be able to generate any significant future revenues. In addition, even if awareness of our CRAiLAR®and CRAiLEXTM Technology increases, we may not be able to produce enough product to meet demand. The loss of Messrs. Kenneth Barker, Jason Finnis, Guy Prevost, Tom Robinson, Jay Nalbach, Ms. Larisa Harrison or any of our key management personnel would have an adverse impact on our future development and could impair our ability to succeed. Our performance is substantially dependent upon the expertise of our Chief Executive Officer, Mr. Kenneth Barker and our Chief Innovation Officer, Mr. Jason Finnis, and other key management personnel and our ability to continue to hire and retain such personnel. Messrs. Barker, Finnis, Prevost, Robinson and Nalbach spend substantially all, or most, of their working time with us and our subsidiaries. It may be difficult to find sufficiently qualified individuals to replace Mr. Barker, Mr. Finnis, Mr. Prevost, Mr. Robinson, Mr. Nalbach, Ms. Harrison or other key management personnel if we were to lose any one or more of them. The loss of Mr. Barker, Mr. Finnis, Mr. Robinson, Mr. Nalbach or Mr. Prevost, or any of our other key management personnel could have a material adverse effect on our business, development, financial condition, and operating results. We maintain key person life insurance on our senior executive officers. As of September 30, 2012, there were 43,923,111 shares of our common stock issued and outstanding. Further, as of September 30, 2012 there were an aggregate of 4,684,045 stock options (4,029,045 were vested and exercisable into 4,029,045 shares of common stock at a weighted average exercise price of $1.66 per share) and 3,057,555 share purchase warrants outstanding that are exercisable into 3,057,555 shares of common stock (at a weighted average exercise price of $4.04 per share). We are not authorized to issue shares of preferred stock. However, there are provisions of British Columbia law that permit a companys board of directors, without shareholder approval, to issue shares of preferred stock with rights superior to the rights of the holders of shares of common stock. As a result, shares of preferred stock could be issued quickly and easily, adversely affecting the rights of holders of shares of common stock and could be issued with terms calculated to delay or prevent a change in control or make removal of management more difficult. Although we have no present plans to issue any shares of preferred stock, the issuance of preferred stock in the future could adversely affect the rights of the holders of common stock and reduce the value of the common stock. Our Common Stock is Classified as a Penny Stock Under SEC Rules Which Limits the Market for Our Common Stock. Because our stock is not traded on the NASDAQ National Market or the NASDAQ Small Cap Market, and because the market price of the common stock is less than $5 per share, the common stock is classified as a penny stock. Our stock has not traded above $5 per share. SEC Rule 15g-9 under the Exchange Act imposes additional sales practice requirements on broker-dealers that recommend the purchase or sale of penny stocks to persons other than those who qualify as an established customer or an accredited investor. This includes the requirement that a broker-dealer must make a determination that investments in penny stocks are suitable for the customer and must make special disclosures to the customers concerning the risk of penny stocks. Many broker-dealers decline to participate in penny stock transactions because of the extra requirements imposed on penny stock transactions. Application of the penny stock rules to our common stock reduces the market liquidity of our shares, which in turn affects the ability of holders of our common stock to resell the shares they purchase, and they may not be able to resell at prices at or above the prices they paid. We are a company incorporated under the laws of the Province of British Columbia, Canada and a majority of our directors and officers reside in Canada. Therefore, it may be difficult for investors to enforce within the United States any judgments obtained against us or any of our directors or officers. All or a substantial portion of such persons assets may be located outside the United States. As a result, it may be difficult for investors to effect service of process on our directors or officers, or enforce within the United States or Canada any judgments obtained against us or our officers or directors, including judgments predicated upon the civil liability provisions of the securities laws of the United States or any state thereof. Consequently, you may be effectively prevented from pursuing remedies under U.S. federal securities laws against them. In addition, investors may not be able to commence an action in a Canadian court predicated upon the civil liability provisions of the securities laws of the United States. We have been advised by our Canadian counsel that there is doubt as to the enforceability, in original actions in Canadian courts, of liability based upon the U.S. federal securities laws and as to the enforceability in Canadian courts of judgments of U.S. courts obtained in actions based upon the civil liability provisions of the U.S. federal securities laws. Therefore, it may not be possible to enforce those actions against us or any of our directors or officers. On September 13, 2012, we issued an aggregate of 418,429 units of the Company to 15 investors at a price of $2.21 per unit for gross proceeds of $924,728.09. Each unit is comprised of one share of common stock and one half of one share purchase warrant. Each whole share purchase warrant is exercisable into one share of common stock at an exercise price of $3.45 per share until September 13, 2014. The Company relied on exemptions from registration under the United States Securities Act of 1933, as amended, provided by Rule 506 of Regulation D and Regulation S, based on representations and warranties provided by the purchasers of the shares in their respective subscription agreements entered into between each purchaser and the Company. On September 24, 2012, we issued an aggregate of 450,758 units of the Company to five investors at a price of $2.21 per unit for gross proceeds of $996,175.18. Each unit is comprised of one share of common stock and one half of one share purchase warrant. Each whole share purchase warrant is exercisable into one share of common stock at an exercise price of $3.45 per share until September 24, 2014. The Company relied on exemptions from registration under the United States Securities Act of 1933, as amended, provided by Rule 506 of Regulation D, based on representations and warranties provided by the purchasers of the shares in their respective subscription agreements entered into between each purchaser and the Company. On October 10, 2012, we issued an aggregate of 198,587 units of the Company to six investors at a price of $2.21 per unit for gross proceeds of $438,877.27. Each unit is comprised of one share of common stock and one half of one share purchase warrant. Each whole share purchase warrant is exercisable into one share of common stock at an exercise price of $3.45 per share until October 10, 2014. The Company relied on exemptions from registration under the United States Securities Act of 1933, as amended, provided by Rule 506 of Regulation D, based on representations and warranties provided by the purchasers of the shares in their respective subscription agreements entered into between each purchaser and the Company. (10) Filed as an exhibit to our Form 10-K for the fiscal year ended December 31, 2010, as filed with the SEC on April 13, 2010. (11) Filed as an exhibit to our Form 8-K as filed with the SEC on August 12, 2010. (12) Filed as an exhibit to our Form 10-Q for the quarter ended September 30, 2010, as filed with the SEC on November 15, 2011. (13) Filed as an exhibit to our Form S-8 as filed with the SEC on February 16, 2012. (14) Filed as an exhibit to our Form 10-Q for the quarter ended March 31, 2012, as filed with the SEC on May 11, 2012. (15) Filed as an exhibit to our Form 8-K as filed with the SEC on November 1 2012.